The quest of guitarist Eric Schoenberg to explore avenues of perfection in steel string guitar design has remained no less keen after half a century. As a traditional fingerstylist playing Ragtime and Blues in the 60s and 70s he was the leading protagonist who inspired guitar makers to return to the dynamics and responsiveness found in instruments made before World War II. Such music as Eric makes requires balance and clarity across all the strings, when playing rhythm, melody and harmony on one instrument, rather than the percussive strumming typical of the Woodstock era. Once designs like Gibson’s Nick Lucas Special, and Martin’s 12-fret guitars and their 14-fret OM returned to shop windows, contemporary guitarists found them as appealing as the traditionalists. 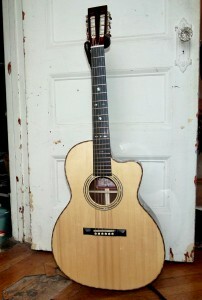 And Schoenberg’s life as a proprietor of fine instruments led him to engage a long list of world-class builders to provide him with guitars under his own brand offering the qualities of the classic, pre-war designs in combination with modern innovations that appeal to today’s fingerstyle player. The latest model from Schoenberg Guitars is just such an instrument. Named the Quartet, the design is inspired by the Martin 0000 size. Also known as the M (for Grand AuditoriuM) this 14-fret flattop guitar used the body shape of Martin’s F-size archtop guitars from the 1930s. In effect they were the next size up from the 14-fret 000. Martin never made a guitar in that size using the Standard 12-fret body shape. 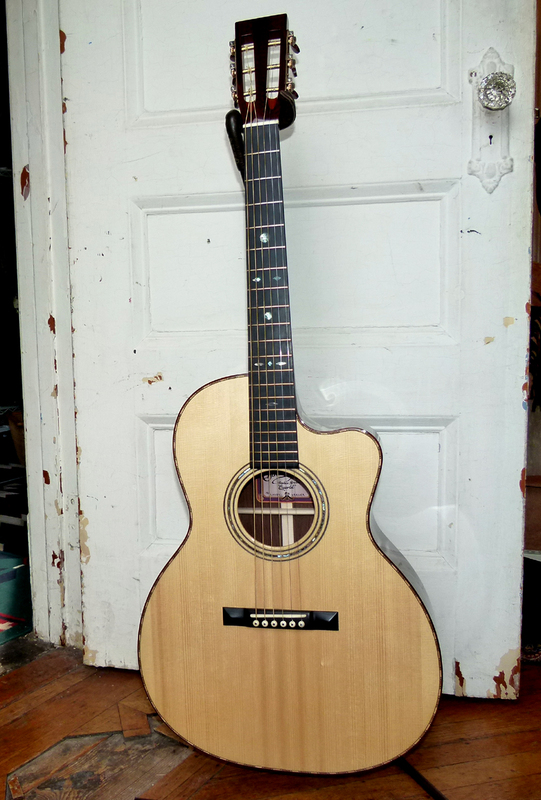 But now Schoenberg Guitars has engaged California luthier Randall Kramer to create such a guitar. And boy is it a great one.